The IR210L attaches to IrDA motherboards via a four pin connector. The Ir Head can be detatched from the rear of the computer for ease of transportation and accessability. This ACTiSYS adapter has already been built into Windows 95,98, NT4.0 and PC link software for IR-capable PDA, H/PC, data terminal and portable medical devices! No additional IR driver installation is needed! 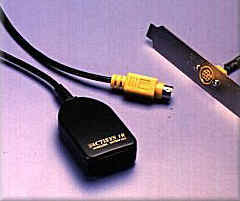 An integral 4-ft cable with DIN8M connector. DIN8(F) Back panel bracket with 5-pin connector to motherboard(**Note only 4 pins used). IR Head with DIN8(M) dongle connector. 1. Pentium or 486 based IBM compatible PC. 2. Built in infrared I/O (IRDA1.0 or SIR or HPSIR)or super I/O(FIR) chip on the motherboard with IR connector and documented in manual. Sharp Wizard, Zaurus, Power Zaurus, SE500.